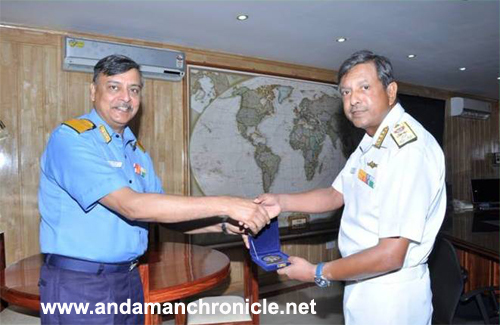 Port Blair, June 19: Surgeon Vice Admiral Tapan Sinha, SM, Director General Medical Services (Navy) is on a four day visit to Andaman and Nicobar Islands to review the available medical facilitie. The Admiral was commissioned into the Army Medical Corps on 22 Feb 1977. The Flag Officer is a Urologist of repute and has carried out more than 500 Renal Transplants to date. The Flag Officer has undergone training in Germany, Switzerland and USA. During his visit, the Flag Officer called on Vice Admiral PK Chatterjee, PVSM, AVSM, NM Commander-in-Chief Andaman & Nicobar Command on 19 June. He will also interact with the Director ANIIMS, Major General (Retd) RP Choubey. The Admiral was also given a brief about medical infrastructure at Andaman and Nicobar Command and is scheduled to visit outlying detachments on 20 Jun 15.